Sovereign Seven of the Seas is a brand new pokie from Microgaming as we mentioned in a recent news post! But here is the review of this hot new pokie game! The pokie is available at Microgaming powered Mummy’s Gold Casino. The pokie is developed by Microgaming which is a leader in the development of online casino games and in keeping with Microgamings tradition of new monthly game releases this pokie has just recently been added! This new exciting pokie offers plenty of bells and whistles over 40 paylines and 5 reels. Microgaming has done a fabulous job with the theme of this game and includes many symbols that represent the life and times of the Nordic age when the sea was their playground! You are engrossed into this world immediately as you look upon the background of ocean waves and the Nordic Sea Vessel. The intricate wood carvings, the sails and more – you name it Microgaming has thought of it. You can enjoy such symbols as ye chest of gold, a brass compass, a brass ship bell, cannons and even a Nordic gal to keep you in good spirits! The rest of the symbols include the standard king, queen, jack, ace, ten and nine. The graphics are wonderfully done in this game and take on a classic feel with a modern flare for excitement. Features include free spins, multipliers and stacked wilds. The free spins come into play when three of the cannon symbols are found in any position on the 5 reels. This awards a random amount of 10, 15 or 20 free spins with up to a 4 times multiplier. The stacked wilds will appear on the center reels only and are in play during both the base game and free spins! There is even the option to gamble your winnings should you be so brave. This is another excellent game from Microgaming. It allows for all levels of play, from low rollers to high. 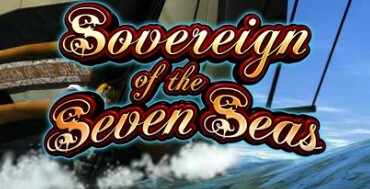 Be sure to hit the high seas and get ready for the adventure you seek in Sovereign of the Seven Seas! As mentioned, it is available at Microgaming powered Mummy’s Gold Casino from the Palace Group of Casinos. At this casino, a free welcome bonus in the amount of $500 is given to a player without any commitments required, and as such this is one of the biggest no deposit bonuses available online. You can obtain the free $500 after you have signed up. With that sum of money, you can begin playing immediately. But, please note that according to terms and conditions you only have one hour to use the $500 – possibly being fortunate enough to win a lot more cash using the free money provided by Mummy’s Gold. It is always advisable to try a casino with a no deposit bonus. This way you do not risk your own personal funds. If you like the casino, you can always make a deposit later!